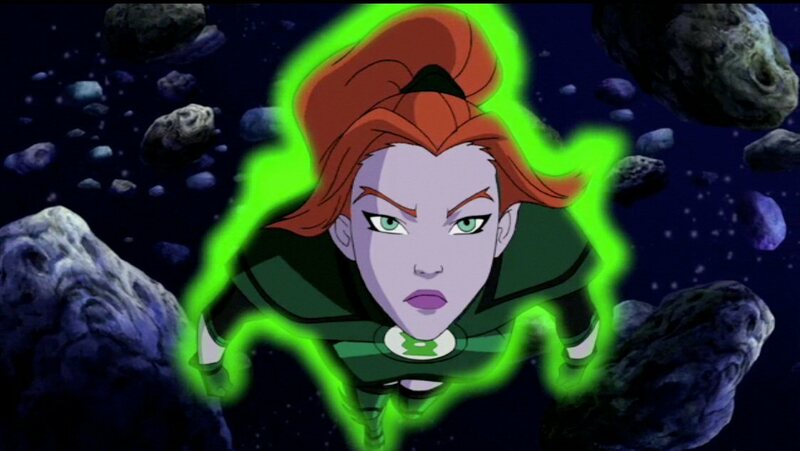 Stewart R: DC look set to make this a lovely jade-hued Summer across a spectrum of media in preparation for the incoming Green Lantern live-action movie starring Ryan Reynolds. Geoff Johns is currently orchestrating the War Of The Green Lanterns throughout the various comic series, if you listen keenly, I swear you’ll be able to hear a thousand Chinese factories pumping mint-in-box toy after mint-in-box toy based on Lanterns of various description, and then there’s the latest DC Entertainment and Warner Bros Animation effort. Having wowed this reviewer some two years ago with Green Lantern: First Flight, Lauren Montgomery returns with Christopher Berkeley and Jay Oliva to lead us through further adventures of the Green Lantern Corps. 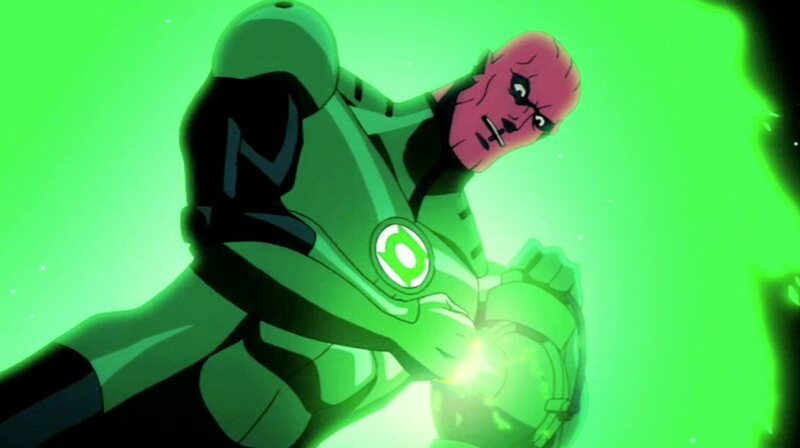 Oa, home of the Green Lantern Corps and the Guardians of the Universe, is threatened by an old adversary once thought vanquished and the growing menace proves dangerous enough to force the evacuation of the Corps homeworld and put the wielders of the Green Light onto the highest level of alert. 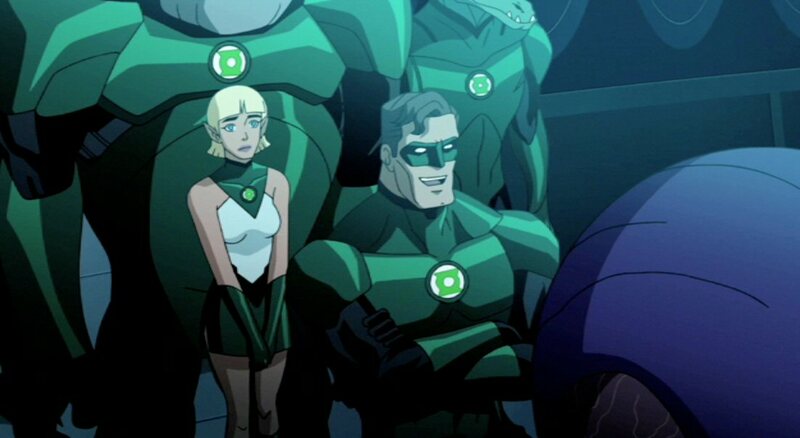 During the preparation of the fight to come, the focus falls upon young Arisia, a Lantern in training with a big sack of self-doubt upon her shoulders. She is calmed and tutored by Hal and Sinestro in tales from the Book of Oa and Lantern lore that will see her through the dark days ahead. These stories reach from the exploits of the very first wearers of the green rings up until one of Abin Sur’s final missions, which adds the the terrific feeling of continuity (and potentially adds a slight connection to the events of this Summer’s big budget film). While First Flight accelerated Hal Jordan’s recruitment as a Green Lantern and Sinestro’s fall towards the yellow light of fear through one contained story there’s enough room to believe that the events that take place ‘in the present’ in Emerald Knights could fall somewhere between the start of Hal Jordan’s training and his mentor’s betrayal of the Corps. This is aided largely by a consistency in the look and feel of the characters under Montgomery’s steady hand which adds a connection between the two films and once again shows her to be one of the very best animation directors in the business. While the different chapters are handled separately by the three different directors and differing animation units, the quality remains incredibly high throughout (but more of that in a moment). A few studios have thrown collections of animated vignettes based upon a character or a franchise at us in recent years with mixed results. There have been loose interpretations of an accepted mythos and the occasional feeling that some chapters and stories are of far higher quality that others - see Batman: Gotham Knight, Halo Legends and The Animatrix. Montgomery and the writers make sure that things are kept tight and clean by having an overriding narrative run throughout which ties all of the various tales together and ensures that they remain relevant. To go into too much detail about the events that unfold would ruin the surprise for your potential viewing so I will simply say that this is how this type of animated collection should be handled. There’s heart by the bucket load, a nice measure on what must be sacrificed to become a Green Lantern, and a real feeling that this is one mission that the Corps may not survive. If you’ve been reading this blog for a few years you’ll know I’m a sucker for animation and can sniff out (admittedly it is strange that my sense of smell is triggered by a visual medium) the tiniest of cut corners and evidence of budget restraints and lowlier units having their go with odd scenes and sequences. 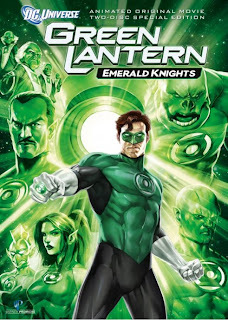 I’m very pleased to say that while not completely free of the odd blip Green Lantern: Emerald Knights proves to be one of DC’s most visually stunning efforts to date. It’s clear from the first two minutes alone that the audience is in for an almost no-holds-barred action fest with complex explosions, liquid and energy movements, as well as frenetic motion editing - three of my key ingredients to be found in a top production - highlighting that this is a studio and creative team working at the height of their game. I’m certainly pleased to see that Berkeley’s two chapters are of particularly epic standard and I’ll certainly be on the look out for his future projects. It seems strange to get so close to the end of a review and not mention the vocal cast. This is not to say that their contribution isn’t worthwhile but for once I wasn’t making a point of spotting who was voicing who and was just absorbed by the story and the spectacle. Perhaps that’s a sign that everyone did such good work as to not be a distraction? Fillion and Isaacs do a decent enough job as Hal and Sinestro respectively, and Mad Men’s Elisabeth Moss instils enough uncertainty in Arisia to make her a stand out. The only slight misstep for me is Rollins’ casting as Kilawog, not having quite the deep and gravelly projection that Michael Madsen managed to deliver in First Flight that suits the gruff Lantern trainer so well. Now, I am tempted by this, but I can only find the double play pack. Don't suppose anyone would know if it's available as a regular dvd for those of us not privileged enough to own a blu ray player? Haha, it was the correct assumption to make, as I do live in the U.K. Thanks for answering my question both here AND on facebook!